My sister asked me to watch the ballet Giselle in CCP with her, as part of the “cultural enrichment” thing we are both doing this year. Of course I agreed because I like ballet, although I’ve never seen a performance before (I did a year of ballet 18 years ago, and I still reminisce about it until today!). I did a bit of negotiating with her, since she just wanted to buy the cheapest ticket, P400, for the 2PM show. 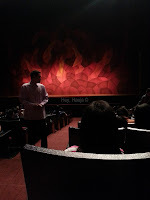 Since that was where we sat when we watched The Phantom of the Opera (and I regretted it since we all had poor eyesight), I argued that we would be better able to watch if we sat a little bit closer. After a few more days, she finally relented to sit in the orchestra section, costing P1000, although we paid a total of P2110, since we bought via Ticketworld’s online portal and they had a 3% service charge (P60) and a P50 pick-up fee in CCP. Note: If you’re using someone else’s card (your mom/dad’s, etc), you have to bring the card you used to purchase the tickets along with the online ticket confirmation letter Ticketworld sent to your email, an authorization letter from the card owner, the card owner’s two valid IDs, and your own valid ID. It was a rainy Saturday, and I was still recovering from a upper respiratory tract infection, so my dad drove us to Sucat via West Service Road. From there, we crossed through the bridge and rode a UV Express FX bound for Lawton via SM Moa. We paid P40 and asked the driver to drop us off at CCP. If you will ride from Sucat to CCP, you will be dropped off across CCP, and you can either just cross the road and walk to CCP, or ride the orange jeep that goes around CCP. The jeepney costs P8. We rode the jeepney because it was raining cats and dogs, and we don’t want to risk crossing the avenue with all the speeding vehicles. For the way home, we just walked to the corner of the CCP block and hailed a passing FX bound for Sucat. We paid P45. While waiting for Giselle to start. 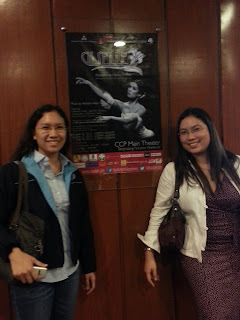 Since it was my first time to watch ballet, I didn’t really have any other show to compare it to. Watching ballet, I learned, is vastly different from watching other shows. You really have to understand the different movements of the ballerinas to know and appreciate the story. Thankfully, one of the heads of Ballet Philippines gave a speech prior to the show and taught us the different ballerina motions for you, me, I promise, dance and death/die. Giselle is a peasant girl who is in love with this rich guy who seems to be a prince. But there is a hunter, who is also pursuing Giselle. Giselle’s mother prefers hunter guy (HG) and dislikes rich guy (RG), but Giselle and RG are in love. They keep dancing and dancing, since they both love to dance. HG discovers that RG is actually a royal and shows a sword to Giselle, but Giselle doesn’t believe him. Then a princess arrives in the scene, and confirms that RGs is indeed betrothed to her. Giselle goes mad with grief and betrayal and dies of a broken heart. In the second act (which I stayed awake for throughout!) HG visits Giselle’s grave. The queen of the dead arrives and tells him to dance. HG dances until he dies. RG then visits Giselle’s grave, and the Queen of the Dead also tells him to dance to his death. Giselle, who has loved him and forgiven him even after death, dances and supports him and saves him, until dawn breaks, and the power of the Queen of the Dead is broken. RG is then saved and Giselle goes back to her grave. I had to Google the real story and found out that my sister’s interpretation isn’t entirely accurate. Visit the page for Giselle in the Ballet Philippine’s website to read the full story. 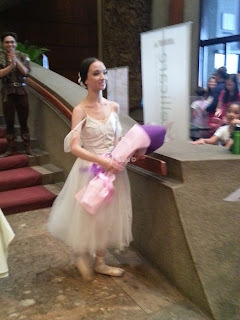 The ballerina for Giselle’s part in the 2PM show was Denise Parungao. She danced beautifully and was very light on her feet. She was very graceful and gave justice to the part. Watching her, I remembered my late schoolmate, Mary Saludares, who was also a ballerina but she died a few years ago, much too young, in a tragic accident right on the brink of her career. I also regretted that I never watched Lisa Macuja’s ballet performances. The photo on the left is Denyse walking towards a guy who was holding out a bouquet for her. He kissed her on the forehead and the crowd went wild with hoots! I don’t know if he is her boyfriend though. Maybe? The other dancers were also very graceful, although for the chorus dances, they weren’t moving in synch with each other at all times. Some lifted their hands a second earlier than the others, or lifted their legs, etc. Still, the performance was beautiful. After the performance, I just walked around the foyer. I found myself standing beside a group of girls who were talking about Denise, and how excited they were to see her. I realized I was standing beside a cordoned off area, and saw a table with pens. I realized that the dancers were going to do a signing of the program booklets, and I was right in front of their table! Prime spot to take a photos and see them up close. 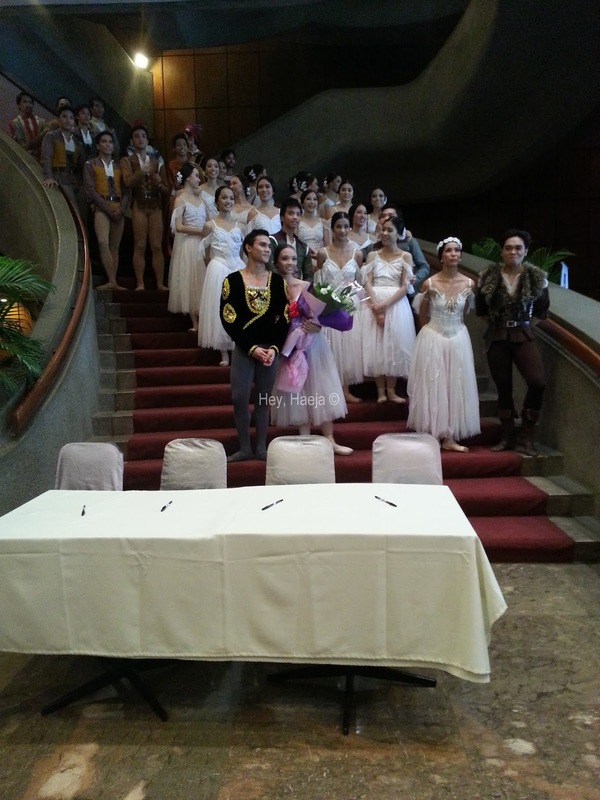 The whole ensemble of the 2PM show of Giselle slowly walked down the stairs. Wait, did I mention Bembol Roco is part of the cast? I didn’t even recognize him, but he is not visible from this photo. 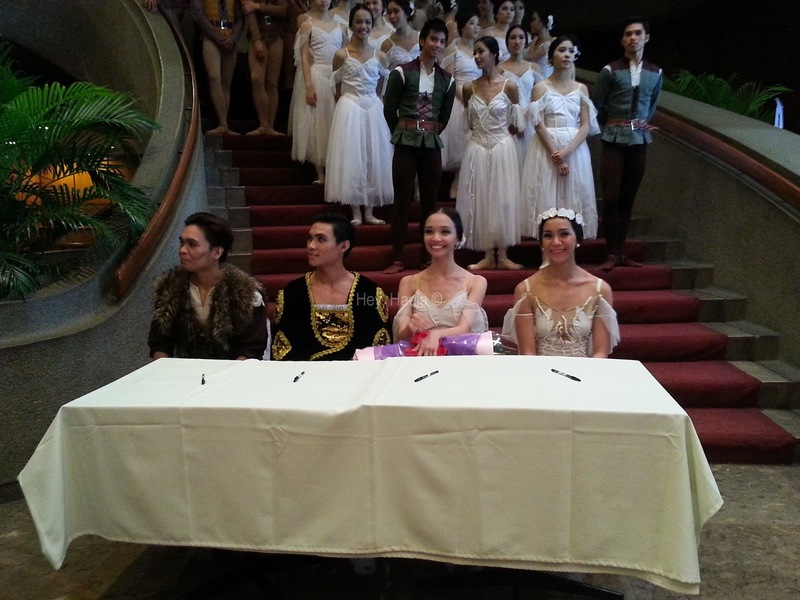 Sitting on the table, from L-R: Marvin Arizo as Hilarion (Hunter Guy), Earl John Arisola as Albrecht (Rich Guy), Denise Parungao as Giselle, and Ma. Celina Dofitas as Myrtha (Queen of the Wilis). They all danced beautifully. I initially thought Celina Dofitas was one of the other Giselles in the other shows because she wsas so lithe and graceful. Left to right: Hilarion, Albrecht, Giselle, and Myrtha. I’m glad we bought the orchestra seats. It was a really nice experience to watch ballet, and I am grateful to the 2PM ensemble of Giselle for the wonderful performance and making us feel the money and the rain and flood-drenched clothes were all worth it.